This delicate white hails “from the sun, the rain, the wind, and the soil” of South Africa. Though described as a “light yellow with flashes of green,” my glass appeared a surprising golden yellow of medium intensity, usually indicative of mature, concentrated whites. Being a very affordable wine (I only paid $7.99 for a bottle), I knew not what to expect. Although the nose is pleasant-but-weak, and somewhat plain, the wine makes up for it with a soft, creamy body and light crispness. Flavors are subtle and playfully elusive. They include guava, gooseberry, subdued mango, and other tropical flavors. There are even light hints of lime and lemon. This is not a “big” wine, and so it must be remembered that although this wine is well-structured, it is very delicate. It will take many sips to appreciate and, like all wine, it gets better as it opens. It is also a wine that can only be fully appreciated when chilled. Serving this wine at room temperature will ruin it. We recommend serving this wine between 46ºF and 48ºF. 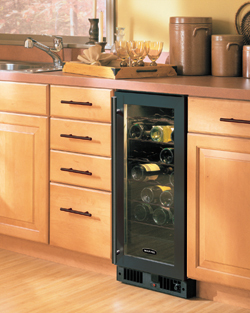 For wines such as this, a Marvel Wine Refridgerator like the 23-Bottle Wine Grotto Wine Cellar will help you attain the perfect serving temperature. As a final note, if you’ve been following our blog, remember that long-term storage temperatures differ from serving temperatures, so don’t confuse the two! Enjoy!